Jonas Munk has very few contemporaries exploring aural landscapes in quite the same way that he does. He seems to create musical canvases that are labyrinthine in scope; yet still as intimate as a warm embrace. His first solo outing, Pan, was warm and bubbling. It floated along a cloud of analog synth chugs and phased guitar lines. It was equal parts Kraftwerk and NEU!-like complexity, yet glowed with a very human core. Equal parts terra firma and the milky way. And, it was a million light years from Munk’s Telecaster abuse in his main gig as guitarist for Denmark’s psych juggernauts Causa Sui. As I sit and listen to his newest solo record, Absorb Fabric Cascade, I get the same feeling I got watching Andrei Tarkovsy’s Solaris: Quiet reflection, an internal journey, and a tale of the human condition portrayed in the cosmos, yet firmly grounded on relatable soil. It’s a patchwork of organic and artificial sounds that let you open your mind to bigger, heavier things. 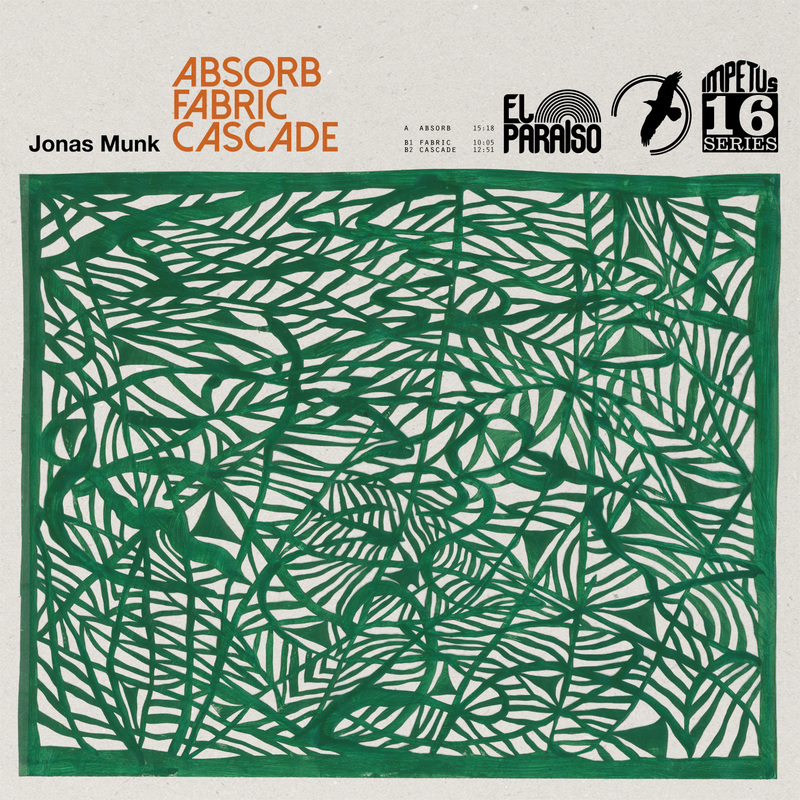 The album is broken up into three sections: “Absorb”, “Fabric”, and “Cascade”. Each are very distinct, yet work well together and bleed into each other, working to create a cohesive, musical trip. Listening you definitely get some Terry Riley influence, as well as Popol Vuh and earlier, sparser Tangerine Dream. “Absorb” feels like a blippy radar. Arpeggiated synth blips and bleeps carry you along as what feels like a blanket of analog warmth comes over you. There’s a percussive pulse that makes itself known, anchoring the song and giving it a center. You really do get the feeling of the universe forming in front of your eyes as you listen to this track. “Fabric”, on the other hand, feels very much “of the earth”. It leans heavily on organ, which in turn makes one reminiscent of Terry Riley’s highly underrated “Poppy Nogood and the Phantom Band”. Munk certainly isn’t aping Riley here. He’s merely using Riley’s musical blueprint as a starting point and building his own trippy structure here. “Cascade” is quiet, reflective, and gives one the feeling of plunging into a mellow darkness. Finding the end of all existence and allowing the ship to fall over the ledge into nothingness. It’s a peaceful ride into the great unknown. With Absorb Fabric Cascade Jonas Munk sets melody and structure aside and replaces them with mood, atmosphere, and journey. This record seems more to be a meditative tome on time, space, and the great beyond than just a casual listen whilst lounging on the couch. He uses repetition to create an almost mantra-like effect that sets the stage for deeper conversation and internal dialogue. Munk may not have intended for this record to be such the heady trip that it is, but to my ears it’s transcendent. Absorb Fabric Cascade is a classical piece for the cosmos. If you’ve ever heard Terry Riley’s A Rainbow In Curved Air it might be that. Otherwise, it’s just one of those albums you can feel at home with right away. I’ve not heard that one. And no it’s not Cinderella ‘Night Songs’ either, before you ask. Ha! A classic in my opinion. 7th grade wouldn’t have been the same without it.